The UMS425 shares many features with the commercial grade, heavy duty UMK models. It is a rugged, dependable and a longer lasting line trimmer. Powered by the new improved Commercial Generation II, Mini 4-stroke GX25 engine, it features Honda’s famous one-pull easy starting for hassle free starting every time. It uses unleaded fuel so you’ll never have to mix oil and fuel again, unlike its 2-stroke counterparts. 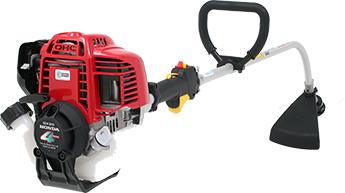 The UMS425'S Easy-grip loop handle and flexible drive shaft offer superior manoeuvrability making it ideal for all your trimming needs around the garden. Not only backed by a network of over 450 authorised Honda dealers around Australia, the UMS425 Bent Shaft Brushcutter comes with a 4 year Domestic Warranty, supporting you and your lawn for the life of your investment. And for contractors and commercial gardeners, the UMS425 Bent Shaft matches all of Honda's other Brushcutter warranties, with a 3-year Commercial Engine Warranty and 1-year Commercial Frame Warranty.